Needle roller and cage assemblies are single or double row units comprising of cages and needle rollers, they have high load carrying capacity, are suitable for high speeds and are particularly easy to fit. This type of needle roller bearing requires a hardened and ground raceway on the shaft and in the housing. Drawn cup needle roller bearings with open & closed ends comprise thin-walled, drawn cup outer rings and needle roller and cage assemblies which together form a complete unit. This type of needle roller bearing requires a hardened & ground raceway on the shaft, if the shaft cannot be used as a raceway, the bearings can be combined with inner rings. 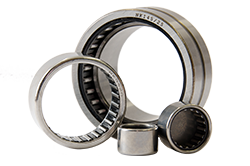 Drawn cup needle roller bearings with closed ends are suitable for closing off the shaft ends of bearing arrangements giving protection against injury & protecting the bearing against contamination and moisture.